Preheat oven to 350 . Have casserole or other pan ready, spray lightly with Pan if desired. If using leftover mashed potatoes fluff up so they will spread easily. Fold sage into potatoes and spread the potatoes thickly in the center of the oven dishâto about 1 inch thick. Using a small juice glass make 4 depressions in the potatoes. Evenly distribute the shredded greens in the depressions, crack and place an egg on top of each "well." Salt and pepper to taste. Bake 20-25 minutes or until the eggs are just set (poached) but not hard. In a large pot of boiling water, add the 12 ounces of spaghetti and let them cook for about 8 to 10 minutes. As the spaghetti is cooking take the two peeled avocados and place them in a large bowl. Take a fork and begin to smash them. Add the lemon juice and olive oil and continue mix/mash the avocados until it becomes an avocado sauce-like substance. 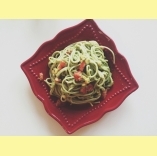 Drain the spaghetti once it has been cooked and add the avocado sauce to it and mix. Chop the tomato and add it to the pasta, along with the corn. Season with black pepper and salt to taste and serve!